On an open-air track in North Las Vegas, a group of engineers are about to send a futuristic train car hurtling along at 400 miles per hour. It's the first public propulsion test of Hyperloop One's technology. The company is competing to turn the Hyperloop concept, Elon Musk's vision for super-fast ground transportation, into a reality. On Tuesday, Hyperloop One -- previously known as Hyperloop Technologies -- announced that it was closing an $80 million round of funding. It now has more than 150 employees split between its Los Angeles headquarters and the new North Las Vegas test facility. Its first public test will take place Wednesday morning. 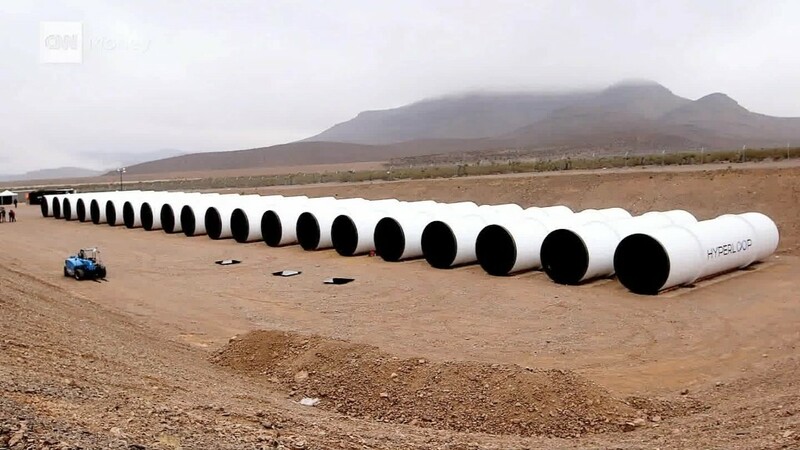 The company also announced its name change on Tuesday from Hyperloop Technologies to Hyperloop One, to avoid being confused with competitor Hyperloop Transportation Technologies. Musk introduced the idea for a high-speed train in a pressurized tube in 2013. The idea is to put people into special pods that move at more than 700 miles per hour inside a partially pressurized enclosed track. The pods are propelled by magnetic levitation, hovering in the center of the tube on a cushion of air. He's a bit busy with his other projects, making electric cars at Tesla Motors and sending rockets into space with SpaceX. So Instead of tackling the train on his own, Musk open-sourced the idea and invited outside teams to take a whack at building the train of the future. Two of the leading groups have announced advances this week. Hyperloop Transportation Technologies said it has licensed a passive magnetic levitation technology that was developed at the Lawrence Livermore National Labs. But Hyperloop One seems to be jumping ahead with an actual test of its technology and more funding. "I think Hyperloop is the next mode of transportation. I think it's going to change so many things so businesses can grow, economies can flourish and communities can thrive," said CEO Rob Lloyd at a press event on Tuesday. Musk's original idea was a Hyperloop train system that would be able to make the journey from San Francisco to Los Angeles in 35 minutes. Hyperloop One is looking beyond just California, and past human cargo. The company announced a number of partnerships with big name transportation companies around the world, including cargo companies, tunneling experts and transportation engineering firms. It's looking into using the technology to transport cargo between Long Beach and Los Angeles. Hyperloop One envisions trains that travel as fast as planes but without turbulence and directly to city centers. They can go underground and underwater, potentially freeing up coast line or moving entire ports out to sea. The company also launched a new global competition and is accepting ideas from students, designers and engineers from around the world. It will choose winners in 2017 and team up with them to start building Hyperloop technology. "To us, transportation is the new broadband. And yes, the internet and virtual reality can transport us in so many ways," said co-founder Shervin Pishevar. "But you just cannot hug a hologram... many things in life still require a human connection."